What is the secret to finding hope in hard times? When Suzan Colón was laid off from her dream job at a magazine during the economic downturn of 2008, she needed to cut her budget way, way back, and that meant home cooking. Her mother suggested, “Why don’t you look in Nana’s recipe folder?” In the basement, Suzan found the tattered treasure, full of handwritten and meticulously typed recipes, peppered with her grandmother Matilda’s commentary in the margins. 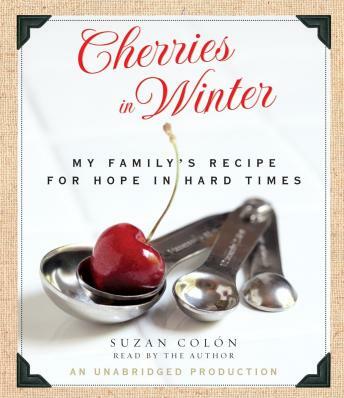 Reading it, Suzan realized she had found something more than a collection of recipes—she had found the key to her family’s survival through hard times. Suzan began re-creating Matilda’s “sturdy food” recipes for baked pork chops and beef stew, and Aunt Nettie’s clam chowder made with clams dug up by Suzan’s grandfather Charlie in Long Island Sound. And she began uncovering the stories of her resilient family’s past. Taking inspiration from stylish, indomitable Matilda, who was the sole support of her family as a teenager during the Great Depression (and who always answered “How are you?” with “Fabulous, never better!”), and from dashing, twice-widowed Charlie, Suzan starts to approach her own crisis with a sense of wonder and gratitude. It turns out that the gift to survive and thrive through hard times had been bred in her bones all along. Cherries in Winter is an irresistible gem of a book. It makes you want to cook, it makes you want to know your own family’s stories, and, above all, it makes you feel rich no matter what.